Muller’s sarcasm questions why we save the best for last. Good question. God wants us to enjoy “abundant life,” today. This “Busy” series is about embracing God’s gifts now, not just waiting for them to come to us in heaven. Of course, this Psalm also provides us with “poignant words of trust” to say at the time of death. As Paul reminds us, death is the last of our enemies to be destroyed. So the Psalm gives us comfort at a time of grief, but the words only ring true if we have trusted and experienced God’s intervention in our lives. So, this morning, ask yourself what this Psalm say to you? Let’s listen carefully for a fresh understanding. Read Psalm 23. 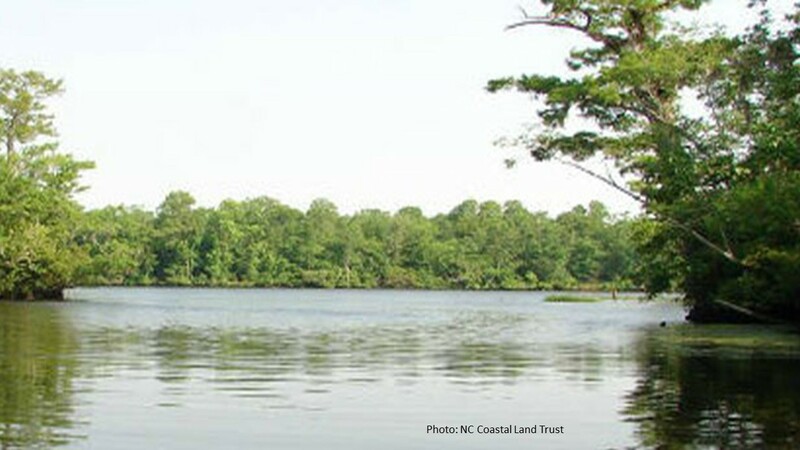 The Northeast Cape Fear River broadens and deepens as it flows through Holly Shelter Swamp. In this area, on a high bluff on the east bank of the river was my scout troop’s favorite camping site. The ridge was forested with tall long-leaf pines. Lining the banks along the river were dogwoods, tupelo and cypress, their branches adorned with Spanish moss. The leisurely pace of the river invited us boys to sit on its banks and throw sticks into the water, watching them slowly float away. It’s the type of life Mark Twain wrote about on the Mississippi, a life of ease beside peaceful waters that seem to hold some mysterious power to heal, to forget our troubles, and to be renewed. In the late afternoon, things would change. As the sun dropped in the west behind trees, it created long shadows on the black waters. An eeriness descended. 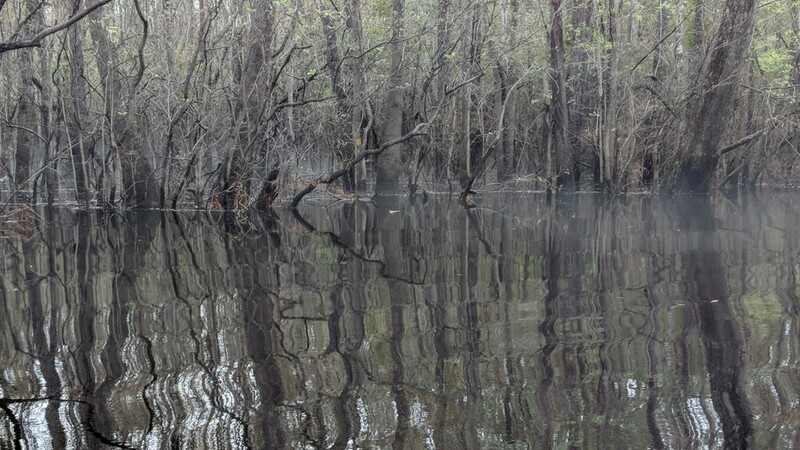 Spanish moss now appeared as the long beards of men whose mysterious and untimely death occurred in the backwaters of Holly Shelter Swamp. We had been warned. Every Saturday around a campfire, we listened our scoutmaster, Johnny Rogena, tell us another story about a man who lost his hand in an accident in an old saw mill that stood nearby. This hand took on an evil life of its own, and had been terrorizing the swamp ever since. Such tales were frightening, especially for an 11 year old boy. As the fire died down, we were sent back to our tents. We stayed together. When a bobcat squealed, we jumped. But soon, we were in our tents and hunkered down in our sleeping bags—the only safe place. These were convenient stories to tell young scouts for it encouraged us to stay in our tents. Sometimes at night we’d see the shadow of the hand stretch across the canvas of the tent, an effect caused by older scouts using a flashlight to project the larger than life reflection. A year or two later, when we were the older, we showed “the hand” to scare the new Tenderfoots. On those first few camping trips, we were scared and afraid to move. It took forever to fall asleep. That night, we knew what it felt like to be in the valley of death. In the morning we’d wake up and feel blessed to have made it through the night. As another Psalm reminds us, “Joy comes in the morning.” We experienced such joy! 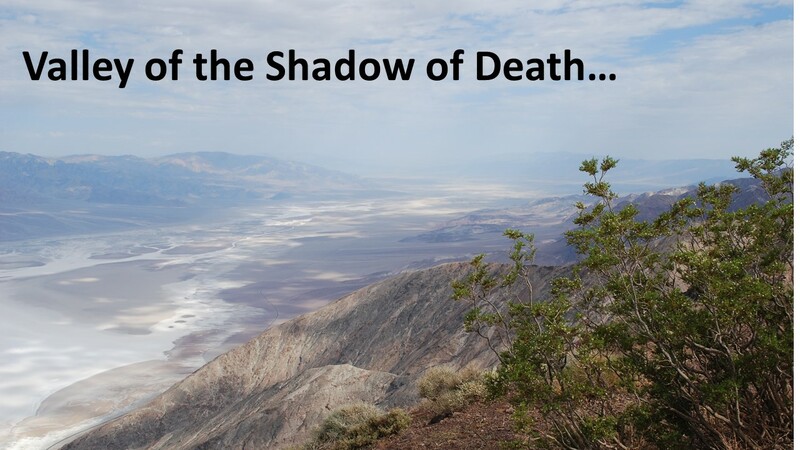 Yea through I walk through the valley of the shadow of death.” This most beloved psalm, as I pointed out, is ubiquitously used at funerals and mostly overlooked on Sunday mornings. This is unfortunate for the psalm tells us about a life lived well—a life lived in complete trust of God the Father. Psalm 23 is attributed to King David and it certainly brings to mind key elements of his early life. As a young shepherd, he knew what it meant to lead sheep through dangerous mountainous terrain. As a mere boy, he was willing to face the giant Goliath on the battlefield. As a young man, he was being chased by the armies of King Saul, who knew he was God’s anointed. And even as an old man with many enemies, he knew the pain of having his own son attempting to take his throne. Of course, we know David had many short-comings, but he made up for them by putting his faith in God’s hands. David was a man, the scriptures tell us, after the very heart of God. We can imagine David, who trusted God even when he screwed things up penning these words. The opening verse captures the essence of the Psalm. 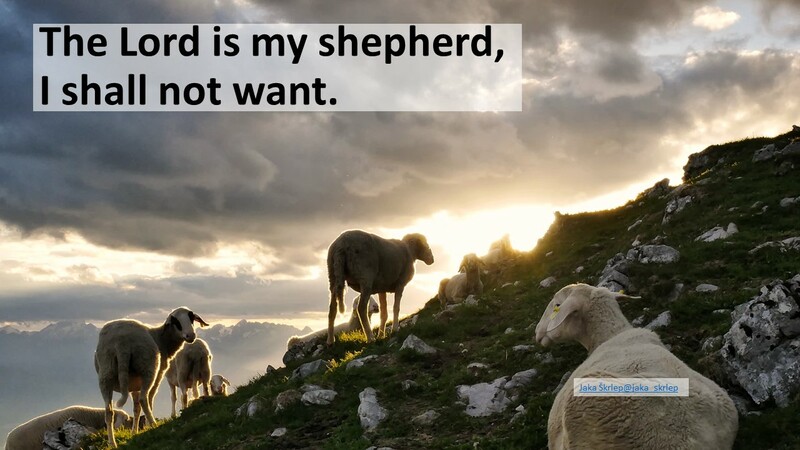 “The Lord is my shepherd, I shall not want.” The Psalm begins with a powerful metaphor of God as a shepherd. Of course, God is more than just a shepherd, which was a lowly occupation in ancient Israel. God is the Creator, the judge, the warrior, the righteous one, the ancient one. 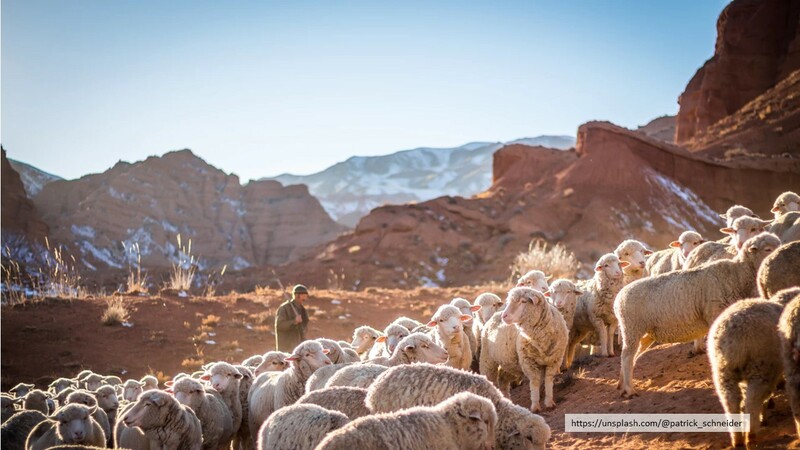 All these images remind us that God is greater than just a mere tender of sheep, but like a shepherd who is devoted to his sheep, God is devoted to his people, which makes the shepherd image the perfect depiction of our relationship with God the Creator. That opening verse ends with this statement: “I shall not want.” It can also be translated, “I don’t need anything” or “I lack nothing.” The rest of the Psalm expands upon what the Psalmist is not lacking. The Psalmist enjoys rest, refreshing water, wholeness, protection, comfort, and an abundance of food and oil. 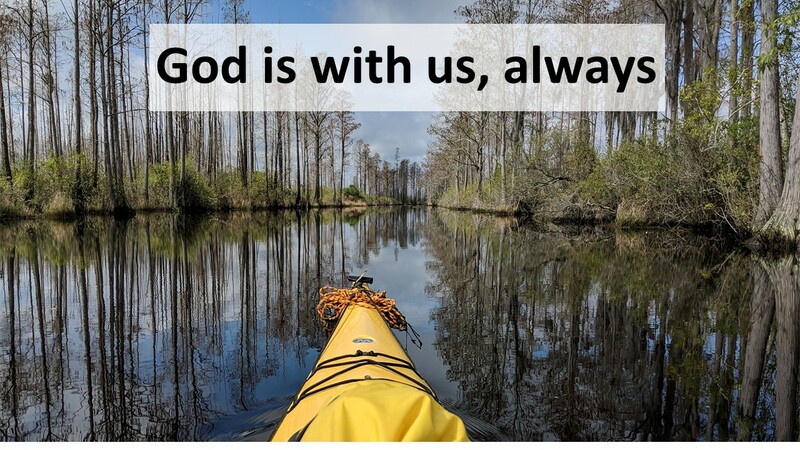 This Psalm speaks to those of us who have experienced salvation, who’d heard God (or an Angel from God) say, “Fear not, I am with you,” or “Fear not, favored one.” When we know that God is with us, we can be comforted despite the challenges we face, whether a made-up hand roaming the swamps of Holly Shelter, or the real challenges we face: illness, abandonment, aging, financial ruin, being falsely accused, among others. We can face these trials because we know that even though everyone may abandon us—friends, allies, and family—we also know that God will never abandon us. God is with us through thick and thin. That’s a promise to hold tight! 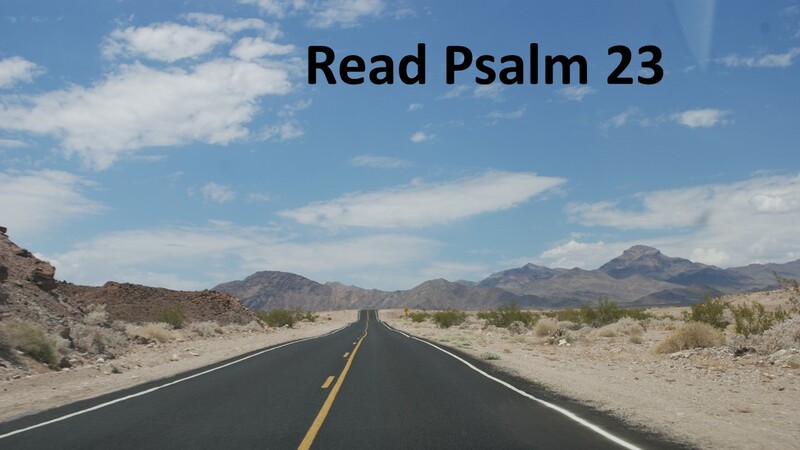 There are two great images at the end of this Psalm. First, there is a table set in the presence of our enemies. Royal banquets are often used in scripture to point to an eschatological future, the promised heavenly banquet where Jesus is at the head of the table and serves us. 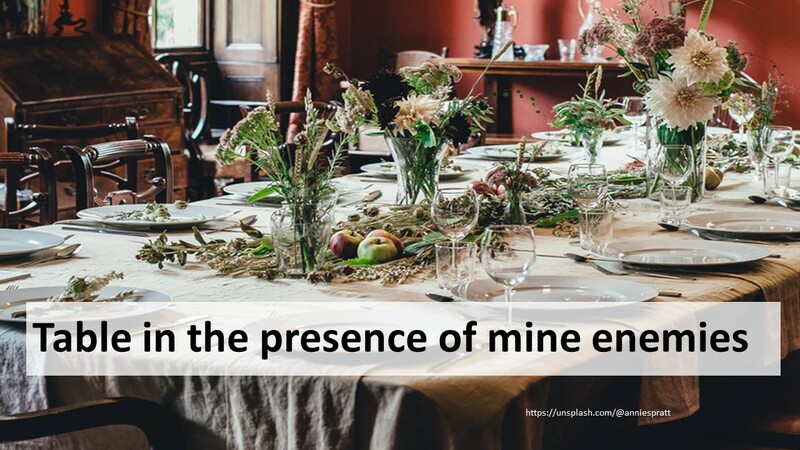 Perhaps the presence of our enemies is an invitation for them, too, to come to the table. They, too, have been created by a God who delights in bringing about reconciliation and encourages us to seek out peace with our enemies. The second image is the cup running over. 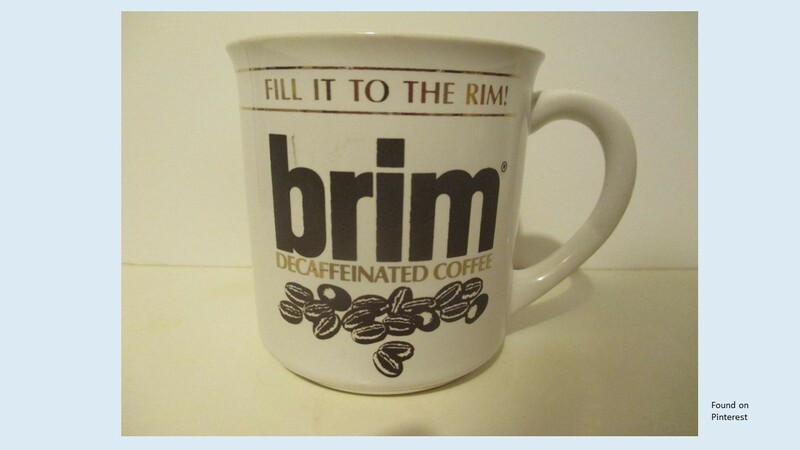 Back in the 70s and 80s, Brim decaffeinated coffee had a series of advertisements about filling our coffee cups to the rim. We don’t serve Brim in the fellowship hall. The ad world is a perfect one and no one that I remember in those commercials spilled coffee on the rug, even when the cup couldn’t contain another drop. But here, in Psalm 23, we’re promised something even greater that being filled to the rim. Our cup overflows! This is a promise of abundance. God’s goodness is the foundation for this Psalm. Just as a shepherd wants what is best for his sheep, God wants what is best for his people. 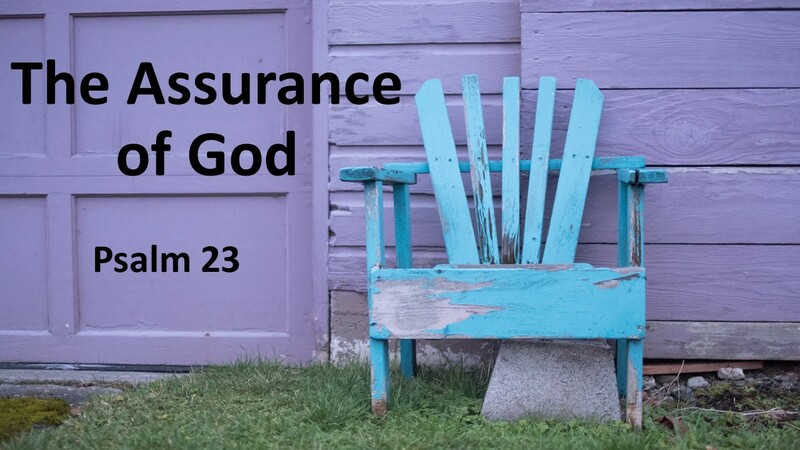 God can be trusted. Yes, there are times we may suffer. Sometimes, as when I was a Tenderfoot Scout, our fears are irrational. At other times, our fears are very real. There are people who want us to fail, thinking that it would make them look better or at least make it easier for them to succeed. There are illnesses that can take our lives. There are dangers and temptations faced by those we love. But even when we face such real fears, we can place our trust in God’s unfailing love. When things are looking down, when life is busy and we can’t seem to get a break, we can go to this Psalm and be reminded that we are not alone. God’s goodness abounds. God’s goodness will overflow in our hearts and lives, giving us a new perspective on the challenges we face. Amen. 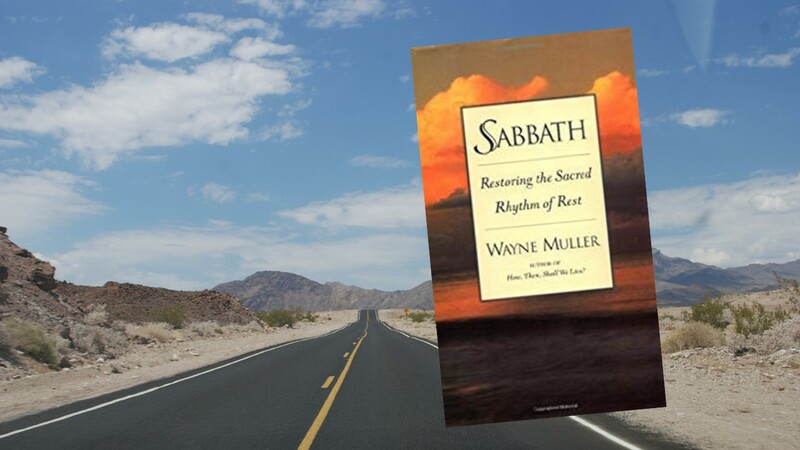 Wayne Muller, Sabbath: Restoring the Sacred Rhythm of Rest (New York: Bantam, 1999), 79. James L. Mays, Psalms: Interpretation, A Biblical Commentary for Teaching and Preaching, (Louisville, KY: John Knox Press, 1994), 119. Genesis 15:1, 26:24; Deuteronomy 20:1, 31:8: Isaiah 41:10, 41:13, 43:5; Matthew 1:20; Luke 1:30, 2:10. I know God is with us always and thanks of God for it! But sometimes we feel sad or alone, when my mompassed almost a year ago was really difficult for me,not only because were my mom and I care her ,she was a friend of mine and one of the most beautiful soul I had known. Still sometimes I cry. I know is about time. but really miss her everyday. Gloria, losing a parent is painful and the loss remains even though the pain lessens or becomes more of an ache, over time. Blessings. Thanks Jeff , still is really painful I wake up in the morning and I think I will call my mom ! A timely prayer for these dark and dangerous days. Ah. So now I know why scout leaders tell ghosts stores around campfires! The prayer at the beginning of this post is very good indeed. The 23rd Psalm has always been one of my favorite Bible passages. It gives me great comfort and reassurance that God will take care of our needs and is always with us.